Not all aliens in movies want to kill us. Some just want to have a jam session, or study earth’s vegetation and befriend some kids, or teach us a cool new language. Those are the exceptions to the rule. Most aliens in movies want to kill us. The alien in Life certainly does. The first confirmation of extra-terrestrial life has arrived, in the form of a microscopic organism found on Mars. A team of astronauts aboard the International Space Station are tasked with studying the sample in a controlled environment. An elementary school wins a contest to name the organism, choosing the moniker ‘Calvin’. Miranda North (Ferguson) from the Centre of Disease Control religiously follows protocol to ensure that everyone on the station and on earth is kept safe. Microbiologist Hugh Derry (Bakare) has the most interaction with Calvin, attempting to determine its composition and nature. Flight engineer Rory Adams (Reynolds) is more than a little disturbed by the creature. Medical officer David Gordon (Gyllenhaal) has come to enjoy life in space, breaking a record for the most consecutive days in orbit. Commander Katerina Golovkin (Dihovichnaya) is in charge overall, and systems engineer Sho Kendo (Sanada) keeps things running smoothly. Things go horribly awry, as they must, with Calvin acting unpredictably, displaying an alarming intelligence. It soon becomes clear that Calvin will stop at nothing to survive, with the mission’s crew in grave danger from a threat they do not fully understand. 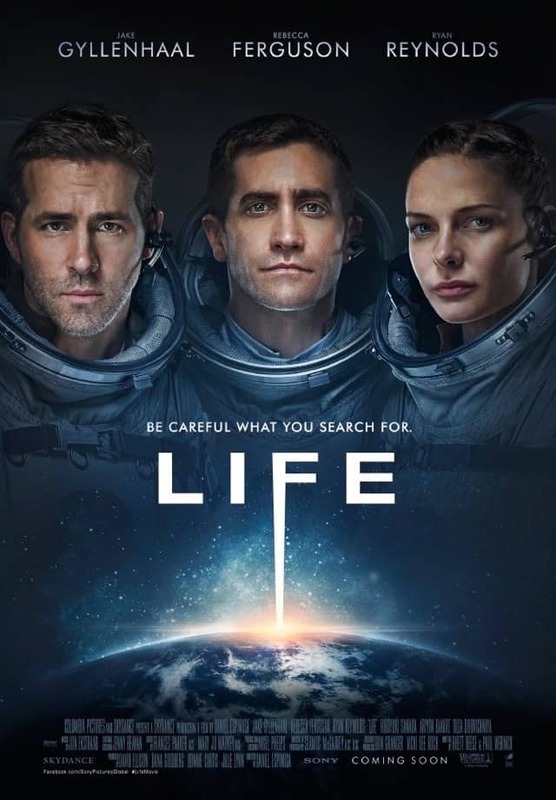 The first instinct many viewers had upon seeing the trailer for Life was “this looks like a rip-off of Alien”. This is completely understandable, seeing as Life is a sci-fi horror film about an extra-terrestrial creature who menaces the occupants of a spacecraft. Life also draws on The Thing, since its protagonists are scientists and researchers. The Thing is based on the earlier film The Thing from Another World, itself based on the novella Who Goes There? The point we’re trying to make is that just because something is inspired by existing material, that doesn’t mean it’s automatically worthless. Life is part of a lineage of sci-fi horror films and builds upon the tradition, but stands well enough on its own as a good example of this subgenre. Life is written by Rhett Reese and Paul Wernick, of Deadpool and Zombieland fame. As such, one might expect the film to be an irreverent deconstruction of movies like Alien and The Thing. Life plays things surprisingly straight, and strikes a fine balance of taking itself seriously while also being entertaining. It plays by its own established rules, and no leaps of logic are demanded of the viewer to buy its sequence of events. Director Daniel Espinosa stages the tension in Life with a master’s touch. Sure, characters make questionable decisions in the heat of the moment, as characters in horror movies are wont to do. However, the urgency and pressure that Espinosa establishes helps justify some not-quite-awesome judgement calls made by our heroes. Each set piece is staged with finesse, and even jaded genre aficionados who feel they’ve seen everything might find themselves subconsciously gripping the armrests during several intense moments. The visual effects by vendors ILM, Double Negative, One of Us, Nvizible and Lola is convincing – Calvin seems like a tangible entity, the weightlessness in the space station is seamlessly done, and the exteriors of the space station itself look realistic. Nigel Phelps’ production design makes the space station an exciting location for the events to unfold in, and even we though we spend practically the entirety of the film in its confines, it never feels visually monotonous. Jon Ekstrand’s orchestral/choral score invokes Also Sprach Zarathustra, famously used in 2001: A Space Odyssey. The music gives Life, mostly set in a single location, a sense of grandeur and scale. The characters are largely likeable and their individual foibles are neatly established. Ferguson was in the running for the lead role in Alien: Covenant, which eventually went to Katherine Waterston. Some might see her role in Life as a consolation prize, but after her breakout turn in Mission: Impossible – Rogue Nation, Ferguson does continue to prove she has leading lady chops. Miranda is level-headed and does things by the book, but isn’t boring and cares for the well-being of her crewmates. Gyllenhaal makes full use of the sensitivity that’s a large part of his charm, making the audience feel somewhat protective over him. After the fate that befell his character in Sunshine, you’d think Sanada would be wary of joining another sci-fi space mission, but he provides a steadfastness and reliability. Sanada also gets a marvellous scene in which he’s locked in a sleeping pod while Calvin lurks outside. Bakare is the stock geeky scientist, but it is an interesting touch to have him develop something of an attachment to Calvin while studying him, unaware of the monster the seemingly-benign organism will become. Dihovichnaya doesn’t get too much to do, but she is the rare Russian character in a Hollywood film who isn’t villainous in the slightest. Reynolds is playing himself, the motor-mouth class clown, and is used judiciously. He was up for the lead role, but scheduling conflicts necessitated him taking a supporting one instead, which we think worked out for the better. Life’s influences might be more than a little obvious, but thanks to energetic direction, a strong cast and convincing visual effects work, it becomes more than the sum of its parts. We also think there’s a market for Calvin plushies, if any toy manufacturers want to jump on that. Summary: A thrilling sci-fi horror film that’s well-paced and scary, Life does its illustrious genre forebears justice.